Every so often, an athlete emerges whose abilities exceed the boundaries of convention and provide a new bright-line of distinction. Michael Jordan, Tiger Woods, and LeBron James are among the special few whose personal contributions, sportsmanship, and competitive drive forever altered the landscape of professional sports. They became legends who brought hope and championships to their loyal fans. And they were fun to watch, too. So, who will be this generation’s King James, exceeding expectations and pumping fresh blood into a stale franchise? It is becoming clear that former Oregon Ducks quarterback Marcus Mariota is the frontrunner for membership into this exclusive club of game changers. And while no professional career is certain, the humble yet explosive Heisman Trophy winner has shown the same athletic brio and record breaking brilliance of our nation’s past masters. Finally, after months of enduring the endless barrage of fuzzy chop logic and analyst hand-wringing in anticipation of the 2015 NFL Draft, the St. Louis High School star will begin his NFL career with the Tennessee Titans as the No. 2 overall pick in the first round. The circumstances are ripe in Tennessee with a new coach in Ken Whisenhunt. And Mariota could be an important piece for a less than exemplary Titans organization turn to its franchise around. 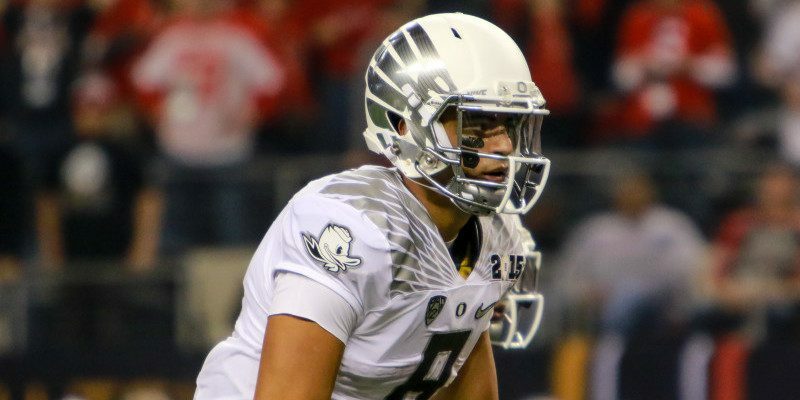 Here are three reasons why Mariota is this generation’s next superstar. Performance Under Pressure As seen before with athletes such as Michael Jordan, Tiger Woods and LeBron James, Nike’s latest advertising campaign is once again trumpeting the arrival of the next great American athlete: Marcus Mariota. Certainly, the advertising execs for the world’s preeminent sports apparel company are hardly incapable of gaffe, but the company’s track record for identifying and endorsing burgeoning talent is impressive. Nike’s first commercial featuring a young James in his first year with Cleveland Cavaliers poked fun at the absurd amount of pressure placed on the 18-year-old’s shoulders. After freezing on the court, James laughs it off. A decade later, the two-time NBA champion ring recipient and four-time MVP has blossomed into arguably the finest active NBA basketball player today. Mariota possesses that same gene: an ability to transform pressure into high-performance fuel. The best athletes shrug off mistakes, maintaining focus with steely resolve as they confront inevitable moments of adversity. In fact, how often do you see quarterbacks congratulate their opponents after they get sacked and then follow it up with a game breaking pass or a 40-yard scamper to the endzone? That is what sets Mariota apart from the field. Former St. Louis High School teammate and friend, Colorado defensive end Juda Parker summed up Mariota’s unshakeable demeanor on the football field. “The stage is never too big for him. He never gets too big headed about things, and I guess that’s how he can do great things and still have a smile on his face,” Parker told Aaron Fentress of CSNNW. Believe the Hype, Nike’s ringing endorsement of Mariota, is a convincing pitch, but Mariota is more than just a sleek commercial from a billion dollar corporation. When Mariota announced he would enter the 2015 NFL Draft, one could almost hear the collective sigh of relief among Pac-12 coaches as Mariota’s reign would finally come to an end. 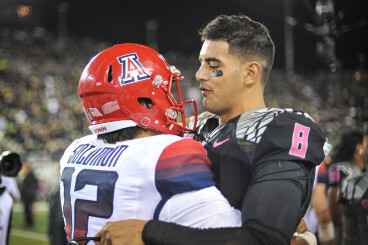 A true sportsman, Mariota is gracious in defeat. I’m not just saying this because we’re playing him in a week and a half, I said it last year that I thought he’s the best quarterback in the nation. I’ll say it again this year: He’s the best quarterback in the nation. Personally, especially looking at our style of offense, Marcus Mariota can play in any style of offense. He can play in our offense. He can play in that offense. He could play in any kind of offense because he can run, he can be dynamic as a runner, but he can also stay in the pocket and throw it everywhere, on time. I just don’t know how he’s going to miss. There will be a transition period, but I don’t see how he can miss. If I was still in the league coaching, and ownership or the head coach wanted an opinion from me, I’d be on the table standing and saying this guy has a tremendous future in the NFL. … He’ll get better at everything. He doesn’t have a shortcoming at anything, I don’t think. I think he can do all the things you want in the pocket. If we pick him at No. 2, you definitely think he can be the Day 1 starter. He was impressive. I’m not sure where that came from that I have a certain quarterback type. Marcus has the qualities I think are important to the position in the NFL. He’s got good leadership. His team really gravitates to him. He doesn’t turn the ball over. … He’s accurate. He can extend the play. He processes things well. That’s really what you’re looking for. So, at long last, the greatest quarterback in Oregon history will continue his career in the NFL. Now, it’s the Hawaiian’s opportunity to jumpstart an eager Tennessee fan base and give Oregon fans a reason to watch football on Sundays. The legacy is just beginning and Mariota’s will be one to remember.